Iris is an incredible activist from the Catskill Mountains of NY. She not only is the crew leader of EG SUNY Sullivan, NY but also an active member of our RYSE youth council. As a little girl when people said democracy, I thought it meant we don't have a king, or one person in charge of everything. The common people have more of a say in decisions, and we vote every four years to elect the leader that we want. I thought it was all fair and equal. Then I grew up. I would like to define democracy as a system that allows people to influence the government by electing candidates whose actions are beneficial to the people. I would like to define democracy as a system that promotes the well being of the population and distributes justice and equality. In the perfect world and ideal society, democracy would demonstrate a governance with the best interests of all and guidance from the populace, along with the coexistence of the earth, humanity, animals, plants, and civilization. I don't think we are a democracy by the definition of the word. Webster's Dictionary defines it as “a form of government exercised either directly by the people or through their elected representatives; rule by majority; the practice of legal, political, or social equality.” Yes, we vote for our representatives. But “Rule by majority” should mean that the mass vote actually elects the leaders we want, right? In the election of 2000, Bush won because of missing votes in Florida. It just so happened that his brother was Governor of Florida. If the American public were told the truth about the real life consequences of fracking and not the lies that the media has fed to us, what would the majority opinion be. If people saw the real facts and heard the stories of those affected by industry's greed, what would everyone think? Not all our political leaders are the ones to blame directly, but they are being paid off by the corporations to not say anything. We have seen this multiple times either directly or indirectly. We have witnessed it indirectly by an askew campaign finance system that allows the rich and powerful to fund political campaigns and make extreme donations. We have seen it directly in the multitude of elected officials who end up leaving office or getting arrested for taking bribes and peddling influence. (Such as Speaker Of The New York State Assembly, Sheldon Silver, and Majority Leader Of The New York State Senate, Dean Skelos.) So is that American democracy? I’d say democracy is a word that is being warped. Do most people really know what the exact definition is besides that they get to vote for a few politicians? Social equality does not exist in America today. Flint is still without water and the Navajo Nation has been without water for years. The rich keep exploiting the poor, the minimum wage is still not enough to live on, and women are still paid unequally by some companies. In reality racism still exists. Heck, one of the presidential candidates is openly racist and sexist (and unfortunately now the next president of the US). The two main options are a woman who has been on the campaign trail for years and made decisions that negatively impacted communities, and a man who boasts about harassing women and kicking people of different ethnicities other than himself out of the country. These are the choices we have for commander in chief. I know many people who are disgusted with both candidates and say they will have to vote for the lesser of two evils. I don't think a true democracy means voting for one so that the other doesn't win. The election of 2016 has at most been interesting, scary, and ultimately has shown how bought out and false our democracy has become. Shouldn't democracy mean that every person has a chance, an honest trial? And the criminals that rob, lie, and kill, are put away, not the teenagers just trying to get by. The true criminals. The ones that rob us with a diamond studded pen and paper. The ones that lie right to our faces about their opinions and how they will help our families. The nicely dressed ones that kill us with cheap food franchises, drugs, toxic chemicals in our clothes, energy extraction operations in our neighborhoods, radioactive waste sites near our schools, fracking fluid in our water, and power plants by our children's playgrounds, to name just a few. The same ones that send soldiers in riot gear to take care of peaceful protesters that are bringing awareness to these killings. Today the American democracy is loaded with nepotism. It wouldn't take very long to go through politicians names and find that they have relatives, friends, and colleagues also working in government. There is something to the old saying “it's not what you know, but who you know” This plays out very prominently in American politics. Today when I look at any politician or listen to what they are saying, I wonder if they are telling the truth. Is that what they believe? Are they going to actually do that? Many times the answer is no. Today's democracy system is ruled by a few with money and influence, not by the people. If the people had an influence it's because we went out in the street and rallied, protested, and challenged our leaders to listen to us! Political leaders will do what benefits them the most. In today's democracy it is vital that the people rise up and take action so that the heads of our country finally do what is best for us. Sometimes we win and other times we lose. Sometimes our efforts don’t make a difference in the passing of a pipeline, but sometimes it does. Then it reminds the leaders that they may be the head but we are the neck, shoulders, and body of this country. We must never give up. This imperfect democracy needs the people, otherwise it would be nothing. Yet sadly, sometimes the very representatives of the people are the ones killing us. The ones force feeding us lies, chemicals, violence, and division. 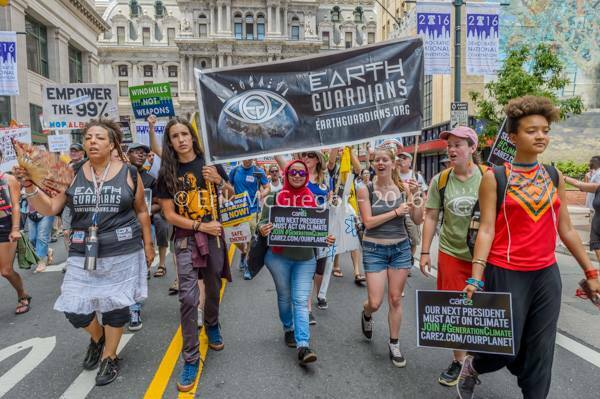 Some Earth Guardians at the March for a Clean Energy Revolution before the Democratic National Committee in Philadelphia this past summer. The American democracy system has many faults. We as the people must stand together and show our political leaders what kind of a world we want to live in. We can ask for changes in the system. Nothing is perfect; democracy certainly isn't. It is also an issue of social change. Our countries leaders are following in the footsteps of leaders before them and unless we create considerable social and political change, people are going to live and act in a warped democracy. The way it's structured is true to the definition of the word, but not the way it plays out which is a democracy ruled by the rich and influential. So are we really a true democracy? Do we call ourselves a democracy, but are actually ruled by invisible kings that influence elections and have their own agenda? Do we live under the monarchy of democracy? In a way, we are all subjects of the kings of democracy but it does not have to be this way. We can create the change we want to see. United we can all stand and make our voices heard by the kings of democracy, instilling what a true representative democracy is. Not a system where we are ruled, but one where the kings of democracy don't exist.